Do you use green food saver bags as a way to make food last longer? Here are some ideas to make produce last. We all want to minimize waste and lower our grocery bills, right? We can achieve this to some degree by preventing our produce from spoiling before we’re ready to consume these food items. This was one interesting question that brought up many good responses at the Wesabe forum discussions. 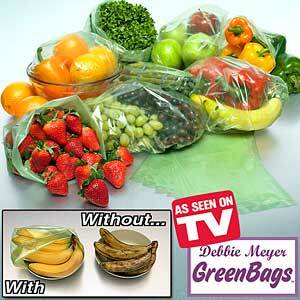 One community member wonders whether green food saver bags (as seen on TV) were worth purchasing. I can only assume that she was referring to the “Debbie Meyer Green Bags” that are hawked in infomercials, the greenbags.com web site, the Home Shopping Network and other channels. These green bags are intended to slow the decay of fresh fruits and vegetables when you put them in storage. The claim is that these bags will prolong the life of your perishables by absorbing any gas released by the food items. The ethylene gas released by fruits and vegetables actually speeds up the ripening process. At last check, 20 bags were going for about $10 plus $7 for shipping — that’s $17 for 20 bags or around 85 cents a bag! Now, it would be great if something can be done to make our produce last longer, but are the bags worth the money? Would the “investment” in these bags be offset by the money you save when you prevent produce from spoiling? 1. The best way to keep food from going bad? More frequent trips to the farmer’s market or the grocery store. Also, buy what’s in season as they will last longer, will taste better and will usually cost less! 2. Go for grocery delivery if you can, which will bring your produce to your doorstep, cut down on your shopping time and save you money on gas. A delivery service like Door To Door Organics in Michigan or in Orlando would help. From Consumer Reports: We saw green inside the Green Bags, but often it was mold. Blackberries became moldy after three weeks, strawberries and basil after a month, and peppers and tomatoes after five weeks. It was a tough test, but the same foods stored in other ways nearly always had less mold or none after the same time. Only bananas fared significantly better in Green Bags: After two weeks, they were firm and had not turned black. 4. Some people freeze their fruits and vegetables and say that thawed berries and frozen banana pops taste great. Hmmm…. maybe I should try this out! 5. Some ways to keep herbs longer: store them in olive oil, or blend them with a bit of water, puree then freeze them into ice cubes. 6. If you store food in Ziploc bags, make sure you date your bags so you know how long something has been sitting in your fridge. Wrap food items loosely in paper towels before putting them in bags, and wash the items right before you consume them, not before you store them. 7. Freeze foods or be creative with your items, especially when you notice them going ripe. Preserve them in jars or include them in cakes and pastries to make them last. 8. Consider using reusable glass jars and recyclable plastic containers for storage instead of plastic bags as a “greener” solution and as a way to save money as well. If you’ve got additional ideas on how to make your perishables take on a longer shelf-life, do share! I wrap my veggies in a paper towel to absorb moisture. I’ve had bell peppers & lettuce last 2 – 3 times as long by storing them this way. Same for extending the life of tomatoes, onions, jalapeño peppers, etc. We all have paper towels or napkins at home, no need to waste money on ‘green bags’. Just spend a little extra time when you get home from the market preparing food for storage and you’re food will last longer. For strawberries – did you know that storing them layered on top of each other actually speeds up the ripening process? I learned this recently, and now, whenever I buy a plastic container of strawberries, I layer them with a paper towel between them. This has extended the life of the berries by several days. Of course, the outcome depends on how they are when you purchase them. If there’s any sign of over-ripeness, you really must separate out the ripe ones before storing the rest. Strawberries just aren’t made to last too long. my wife swears that organic produce last longer. i don’t believe her, i think it is just another excuse for spending money at Whole Paycheck. Tim, that’s too funny. I thought it was a typo at first, then I realized it was deliberate: “Whole Paycheck”! I don’t have a choice — I have to get some of my groceries from there because I am “gluten sensitive”. It’s one step to Celiac disease so I’m being careful that I don’t tip over into that condition. Organic food choices abound though. But yeah, it makes the wallet smart (smart as in “hurt” not smart as in “shrewd” or “clever” 😉 ). We used the organic delivery service for awhile. On the one hand it was awesome because we saved a lot of time and gas not going to the grocery store. The only problem is we didn’t change our order enough. So I would get a bunch of watermelon and realize I am totally sick of watermelon but its already here. But I think if we were more diligent it would have been better. 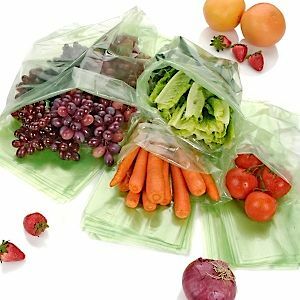 Yes I think these kind of bags may certainly help keeping food fresher a bit longer for sure! Here’s a great tip for the green bags if you have them. Take them to the store with you along with your reusable grocery sacks. Use them in place of the throwaway plastic bags in the produce department. Then, when you get home, just stick them in the fridge, no need to re-bag them. Environmentally friendly & a time saver! Great tips. I normally wrap my veggies in a plastic bag. Before i wrap it i simply spray a small amount of water so that my veggies remain fresh. I have Celiac and I rarely shop at Whole Paycheck anymore. Although I do sometimes have to stop in for GF flours (I like the Authentic Foods superfine rice flour), you can find a much better deal on the Tinkyada rice pasta at Amazon. I also buy my Mahatma wild rice mix at Amazon (in bulk, to reduce shipping fees). I’m about to try white rice flour from the local ethnic supermarket. Trader Joe’s has a good selection of GF options, too. Ok, so I came home from the bar one night and thought that these bags were the greatest thing since sliced bread. Of course, those darned infomercials are rock solid if you’ve had a few. 🙂 So I bought them and tried them and didn’t notice anything spectacular about the time that they kept fruit. I’m not sure it matters or not, but I keep my fridge very cold. I put it on the coldest setting that won’t cause things to freeze. I think that might be the key. Anyway, if you want some green baggies like you see on tv, let me know. They didn’t do much for me. I tried the green bags a few times and found that they do indeed improve longevity of produce. You have to store it ripe and dry to begin with–and you have to store it in the fridge in the green bags. I have not tried to make anything last 3 weeks–but I have strawberries in the fridge now that are over 2 weeks old and are still in good shape–they don’t look as pretty as they did brand new–but are not soft or yucky or moldy. I’m just using mine to put garden stuff in when I don’t have time to process right away–or to keep things fresh while I’m out of town a few days. They aren’t perfect but I think they are better than most methods for a little help. I posted about them on my blog too. The “green bags” work great for me. I can only shop once a week. Leaf lettuce, celery, carrot, radishes and green onions last the whole week. Now bananas are another story. They ripen much faster in the bags than sitting in the fruit bowl on the counter. I bought my bags from Ebay. $5.00 no shipping for 20 bags. AND you can reuse them. @Silicon Valley Blogger: you mean “gluten” for punishment that’s why you shop at Whole Paycheck. j/k. my colleague used the green bag for avocados and the suckers lasted a very long time. so i think perhaps they work better on somethings and not on others. now my wife has gone to a Whole Paycheck for pets and getting our doggie healthy food too. man, i guess i need to eat more unhealthy foods in order to offset the cost of the healthy stuff. Thanks for the heads up! We do have a Trader Joe’s close by too — although somewhat farther than our local Whole Foods. I’ve visited them on occasion but I’ll see if I can go by more often. That’s a good one (re: your “gluten” joke)! 🙂 Now, now… unhealthy foods may be cheap, but they can come back and haunt you later. I know quite a number of people hitting the Ramen and Cup o’ Noodles these days, but I keep telling them how afraid I am to know what’s in the ingredients! The melamine scare in China sure gets me paranoid! Interesting findings on the bags. Sounds like they have mixed results! The downside of tip#1 is that folks who make frequent trips to the grocery story tend to buy more than they intended. Takes discipline, sure. I either buy and freeze (works esp. well for berries and bananas), buy frozen veggies (esp. out of season), or buy only the amt of fresh salad makings or other veggies that I know I can use before my next regular trip to the grocery. Keeps spoilage to a minimum. I have found the best way to keep food fresh is to keep it on hanging on the plant. Many vegetables stay fresh for a very long time if you simply don’t pick them until you need them. Of course, that means you have to grow them too, and that is the fun part. You can stop worrying over the price of things at Whole Paycheck if you just grow it yourself. Seed, water, soil and sun are fantastic at providing food. The concept of leaving things on the plant also applies to harvesting vegetables in the winter. Grow it in the fall and keep it double covered in the winter with greenhouse poly, and you’ll get a little growth, but mainly it will sit and wait for you to harvest for months. What was great in France (when I was there last summer) was the fact that they did not automatically give you a plastic bag regardless of how many items you had. In the UK, they just give you too many plastic bags in most shops you go to. If you want to try out the big ziploc bags and see if they keep your veggies and fruits fresh longer, there is a good coupon at wal-mart right now. Buy a pack of Scot towels (coupons for scott towels are easy to find – I’ve got about 100 of them) and get $4 off your next purchase of big Ziploc bags. I was at the Wal-Mart on Thurs and noticed this deal. Nice tips. appreciate the information. Those are great food saving tips! I like the herb in olive oil one.. I’ll have to give that a try. There really seems to be a lot of mixed results with those Debbie Meyer green bags. Although I find you can keep your produce much longer simply by wrapping it in paper towel and putting it in those aerated ziploc bags. They seem to be doing the job! Those are great tips. I guess I also know one product I won’t invest in. Yes, I use my foodsaver almost daily, but not for the bags. I keep my espresso beans (it takes me a good month to go through a whole pound) in one of the small canisters, along with the scoop. It keeps the beans very fresh. I don’t usually use zip bags for keeping my fruits fresh. But I have tried keeping them in the fridge and it does taste good! Good tips on how to make our food last longer. I am normally fairly lazy about my vegetables and just throw them in the fridge however they are when I buy them but I have been trying to make an effort to use the bags and I think my veggies are staying crisper and fresher longer! These green bags are intended to slow the decay of fresh fruits and vegetables when you put them in storage. It is useful to me !